Water levels on the Ottawa River can be quite low once the spring melt has worked its way from the watersheds and tributaries that feed it. 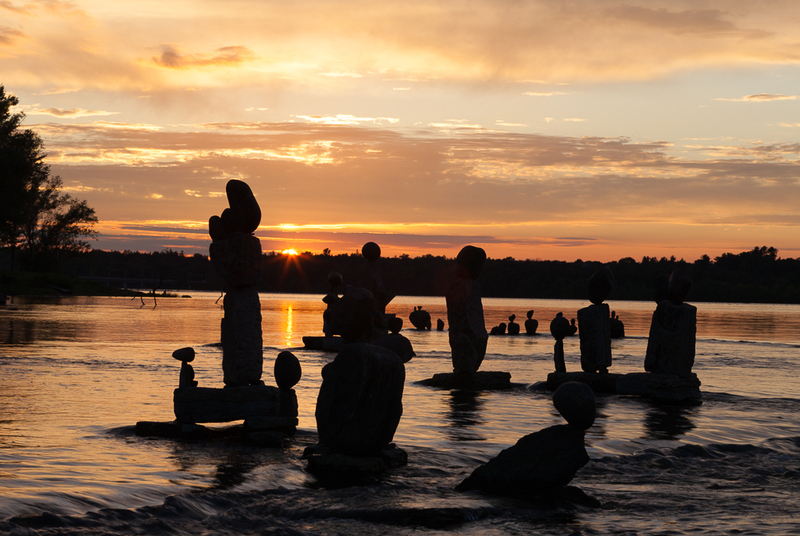 With the lower water level comes the anticipated return of a local artist, John Ceprano, and his rock sculptures. I returned for a second consecutive evening to the Remic Rapids on the Ottawa River to get this shot (my first attempt was a “fail” because of the intrusive solar flair spots that I had not been able to control on the previous shoot). I came better prepared for this evening as well, wearing shorts and sandals to allow me to get into the water, which was quite comfortable given the 23°C (75°F) high we had experienced earlier that day. It truly felt like the last evening of summer like weather that we might enjoy for some time to come.